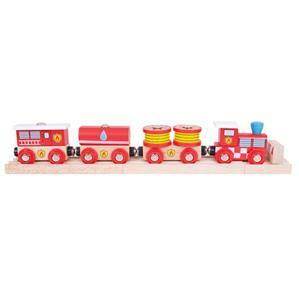 Race to the rescue with this wooden Bigjigs Rail Fire and Rescue Train! The fire engine pulls three carriages carrying removable loads including hoses and a water tank. Supplied complete with two pieces of wooden Bigjigs Rail track and a buffer. Magnetic couplings ensure compatibility with all other engines and carriages in the Bigjigs Rail range. Most other major wooden railway brands are compatible with Bigjigs Rail.